ADMISSION: $25; All proceeds support the Santa Monica Playhouse Benefit Campaign. 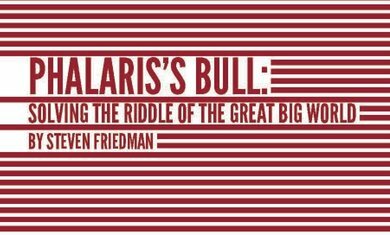 In a spell-binding and often divisive performance, Friedman offers a solution to the world’s pain – a philosophy reflecting Kierkegaard’s story of an ancient torture device, Phalaris’s bull, that turned the terrible sounds of pain into music. "He’s not your typical playwright; he’s a bona fide genius. The 80-minute evening is as close as you’re likely to come to receiving an exclusive tour . . . of a great mind." Steven Friedman (Author & Performer) Generally considered by his teachers to be the most gifted student they had ever taught, Steven Friedman excelled in academics from an early age. After graduation from Harvard, Friedman was accepted into the PhD program in molecular biology at UCLA under a grant from the National Cancer Institute and then into UCLA's School of Medicine. His contributions to molecular biology and medicine range from developing methods to work out the structure of viruses to conceiving smart chemotherapeutics against cancer. As a fine artist, Friedman has been represented by Robert Berman Gallery at Bergamot Station Arts Center in Los Angeles since 1999. His art, ranging from representational pastels to acrylic-under-acrylic poles, has been featured in numerous solo and group exhibitions and has entered major collections around the world. His writings include over 200 works of philosophy; six collections of lyric poetry; the play, A Passion of the Mind (1980); and the philosophical narrative poem, The Books of Joshua (2008). His output has also included such unconventional forms as the beachbook, T Lite Book by the Sea, in 5000 tea-lights adjacent to Santa Monica Pier in 2009 and the skybook, Proving God in Worlds from Even to Odd, over Huntington Beach, CA, in 2010. His solo show, Phalaris’s Bull: Solving the Riddle of the Great Big World, premiered the 2015-16 Winter Season at the Beckett Theatre at Theatre Row, NYC. For more about the show, go to solvingtheriddleplay.com.